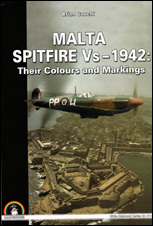 In 1942, any pilot serving the RAF was dreaming to go to Malta, because it was there where action, fame and glory could be found. That year, the Spitfire was sent to replace the Hurricane to defend the island. Under constant pressure, the Spitfire units suffered heavy losses but eventually won the game. In 1942, the Spitfires arrived in batches, and often were sent to combat the same day of their arrival. Due to operational requirements, camouflage was not seen as a priority and several schemes following more or less the current regulations were used in the same time. This is a study that has always fascinated modellers and various speculations arose since the beginning in trying to know whether a particular aircraft was painted in a certain way or not. Brian Cauchi is offering here other theories, all very well justified, and sometimes backed by recollections from people who were on the island at that time. As these were written over 50 years after the facts, so they must be taken with caution because memory is not infallible. Now all that remains a theory, the debate is far from being settled, but in the light of new material, this book certainly provides new food for thought. Each profile in colour is based from a photo which is published, giving to the reader the chance to make his own opinion on it. While some captions are incorrect (as Spitfire serialled AR471 instead BR471 instead – i.e. book Brian Cull and Operations Record Book of 126 Sqn, the AR471 having flown - and lost - with the 229 Sqn only), it remains without a doubt an excellent book that will please more than a Spitfre enthusiast. En 1942, tout pilote de la RAF en quête d’action et de gloire rêvait d’aller se battre à Malte. Cette année-là, le Spitfire arrivait pour remplacer le Hurricane à la défense l’île. Constamment sous pression, les unités de Spitfire subirent de lourdes pertes mais finirent par enlever la victoire. Au cours de 1942, les Spitfire arrivèrent par vagues, et furent souvent envoyés au combat dans la journée même. Du fait des exigences opérationnelles, le camouflage n’a pas fait partie des priorités et plusieurs schémas plus ou moins réglementaires ont cohabité pendant la même période.